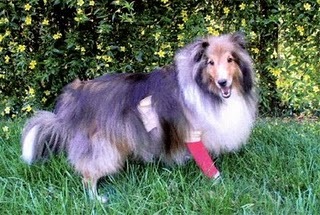 Sacramento Sheltie Rescue was told Scooter jumped off the steps onto his owners concrete patio, breaking his leg. 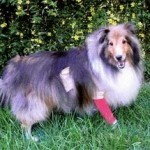 They refused to pay his vet bills & instead surrendered him to Sheltie Rescue. Blue Ravine Animal Hospital discounted his surgery, and donated all Scooter’s post surgery care.